For the past 30 years Tony Cragg has consistently produced original ideas and a remarkable diversity of forms employing a vast array of materials and techniques. It is difficult to characterise his work within a specific style or art movement. In the early 1970s a new generation of British sculptors celebrated a certain freedom from the snares of style which had bedevilled their immediate predecessors. Under the influence of conceptual art, a pluralist environment in which almost anything could happen began to flourish. Conceptual artists proclaimed the subservience of material form to content, thereby allowing any material or method to be employed in their service. Some artists took this dictum to devalue the material properties of ‘fine art’ and began privileging media associated with popular culture, including text, photography and video over more traditional materials. Cragg, by contrast, was among those who translated this freedom into an infinite possibility for systems and material processes with which to conjure new and provocative objects. In this he had more in common with the European arte povera artists than with Transatlantic conceptualism. His early works included materials such as coloured plastic fragments found along the Thames embankment, old furniture and machine parts. These were always ordered according to precise systems reflecting both his scientific orientation and the working ethic of rigorous systems and logical processes that prevailed in British art schools at the time. In Cragg’s work, however, there was always room within this order for random variation, just as there is in nature. Paradoxically the limitation imposed by these systems was liberating because they replaced the constraints of reproducing appearances on the one hand and the formal recipes of basic design on the other. Working within these systems, artists could incorporate all manner of material, even celebrating excesses of material diversity without losing the logic of the form. ‘Spyrogyra’ captures the general good humour of Cragg’s sculpture while embodying some of the most profound aspects of his work as a whole. 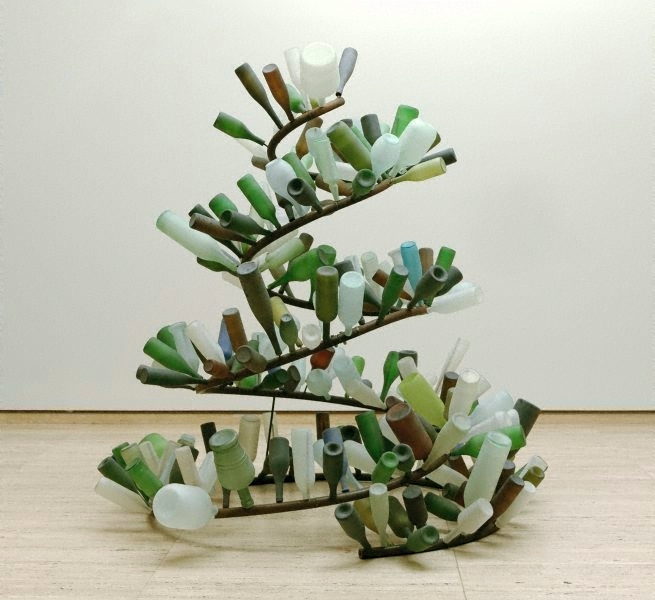 The bottle rack is of course a reference to Duchamp’s famous Readymade, ‘Egouttoir’ (bottle rack) 1914 1; this alludes to the playful conceptual aspect of Cragg which so often makes witty allusions to art history. The structure is however far more open and intuitive than Duchamp’s original. The spiral immediately suggests DNA and organic couplings, which are ubiquitous in Cragg’s forms. Each rod attached to the spiral can take certain kinds of bottles, not a unique bottle but one of a general kind. As a result every time it is assembled it changes in the particular but maintains its essential form. In this way it mimics the genetic accommodation of kind and individuality. The reference to scientific structures is invariably a key theme in Cragg’s work.